Loose and sagging skin are caused by a variety of reasons, including a decrease in the skin’s ability to provide support. Technically, laugh lines are not wrinkles, they are caused by loose skin. Through intensive research, b.glen examined the lifting effect in the morning when "sleeping" skin naturally wakes up, and designed a formula to enhance this effect. Treat fine lines, throughout the day, with the the unique components found in QuSome® Face Lift Complex. You’ll experience a comfortable tension along the jawline and under the chin where skin tends to become loose. 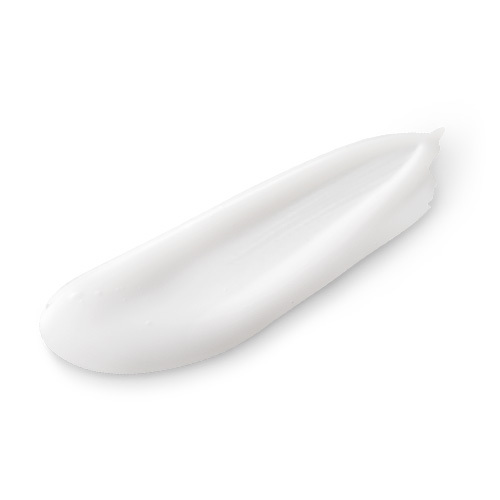 Smooth, soft formula that glides onto skin, making it easy to massage onto face, throat and skin. Achieve naturally firmer-looking skin, sharpen the appearance of the jawline, and diminish the appearance facial lines with the combination of unique ingredients found in QuSome Lift and our facial massage techniques. 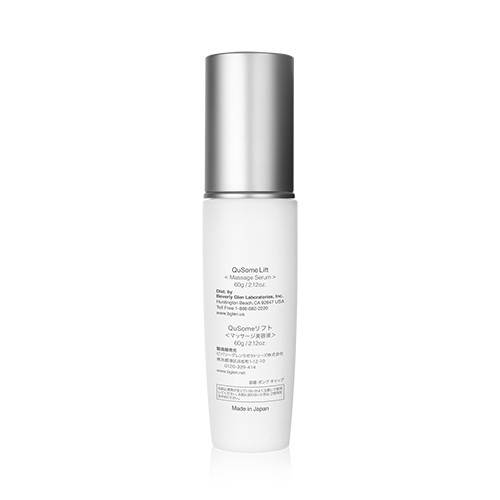 Moisturizing ingredients, from select amino acids, chosen for improving the skin condition. Has same molecular structure as choline, a substance found in the human body. Xanthan Gum helps tighten up the slack in skin. Tightens slackened skin from the outside. Enhances skin's natural beauty by adding moisture and keeping it conditioned. Passiflora Edulis Fruit Extract helps reduce puffiness and dullness for more luminous, healthier-looking skin. Place 1-2 pumps of QuSome Lift into the palm of hand. Then spread over entire face and neck. Next, repeat steps 2 to 6 three times each. Placing the four fingers of your left hand under the right side of the jaw along the jaw line, smooth QuSome Lift upward from the bottom of the chin to the back of the ear. Next, slide fingers from behind the ear down to shoulder and then to clavicle. Then perform on opposite side of face in the same manner. Place the four fingers of both hands below chin and slide upward to front ear area. Then, slide fingers down sides of neck to collarbone. Place hands on nasolabial fold areas and then slide hands upwards to front ear area. Then, slide fingers down sides of neck to collarbone. Next, press middle fingers of both hands on sides nostrils and then circle around eye area by moving upward between inner corner of the eyes up above eyebrows. Using the two fingers, index and middle finger, and starting at inner aspect of brow, gently apply pressure as you go around the eye area. Next, using four fingers, alternately press hands upward over forehead. Then, place palm of the hands on the center of forehead and smooth outwards towards temple area. Finally, wrap whole cheek area in the palm of the hands and then slide hands upwards pulling skin up to the hairline. Rest hands there briefly before finishing. ※Please only apply the next skincare (serum, cream, etc.) after fully massaging lotion completely into skin so that none is remaining on the surface of the skin. ※If stickiness persists, please press skin lightly with tissue. Q1 Is massage necessary? Will it work effectively without massage? Should I massage morning and night? We recommend applying QuSome Lift with massage every day because it optimizes the effect reliably. Additionally, when massage is done in the morning it promotes blood circulation, which brings a sense of transparency to the skin. As a result, you'll be able to enjoy your days reassured and confident with longer lasting makeup. Q2 Can I use it on my eye area? It can also be used around the eye area. However, please be careful not to come in direct contact with the mucous membrane area of eye. Please apply use with caution especially in these delicate areas. Q3 Can I use it with QuSome Retino A? By using these two products together, you'll be able to treat the signs of aging that you are most concerned about such as wrinkles and sagging skin at the same time. Therefore, please use it together. Q4 Can it be used on the neck area or jaw line? Of course, it can be used in those areas. Since the QuSome Lift is applied with massage that encourages the drainage of waste from the neck to the collarbone, it is therefore very effective also for treating the neck area and jaw line. Q5 Will this cause me to have a slimmer looking face? As we age both the amount of collagen and elastin decrease in the body. As a result, the skin's tone weakens from the inside, which causes the skin to appear less tight and saggy. Applying QuSome Lift with massage will cause the skin to lift up from the inside as expected and result in a slimmer looking face. Q6 Please tell me the merits for applying it in the morning. QuSome Lift works quickly to smooth out the jaw line before going out and keeps the skin firm all day, so we recommend use especially in the morning. For a more aggressive approach, please apply twice a day, morning and evening. Q7 Can apply with massage while in the bath? You may apply with massage while in the bath. Blood circulation improves and metabolism rises. Q8 Is it effective on sagging pores as well? Sagging pores are caused by such things as the decrease in collagen, which causes a collapse of the jaw line. The massage effect of QuSome Lift gives elasticity to the skin and therefore is also effective on tightening sagging pores. Q9 Can I use on my body? You can use on your body. Q10 Is it safe to use while pregnant? Yes, it can be used while pregnant. Generally, it has been said sensitivity might change while pregnant and/or lactating due to hormonal changes. If are concerned about using new skincare product, we recommend consulting with a doctor in advance. Q11 Can men use it? Of course men can also use it. Q12 If I use an all-in-one gel, when should I still apply it with massage? Please apply with massage after using an all-in-one gel. After massage, blood circulation is promoted which also increases the moisturizing effect. So if you do not feel any dryness, apply QuSome Lift firmly on the skin by wrapping your face with both hands to aid absorption, which completes the treatment. Q13 How is it different from the Face Massage Cream? Face Massage Cream slims by burning fat with massage and is geared to mainly slim the face area. QuSome Lift has a massage effect, which fights sagging and tightens skin. Our Lift is a beauty essence that smoothes skin with massage without straining the skin and offers smooth texture with smooth elongation. Q14 Can I use it with a facial massager? Since QuSome Lift incorporates our exclusive penetration technology, it can be used in combination with a facial massager but it will not increase the effectiveness. Q15 If using a face mask, when should I apply it? Please apply face mask after having applied QuSome Lift.